I'll come up with some predictions later this week. I don't need a free space, NX toaster is almost guaranteed, so I'll take that as my free space. "Here is the Nintendo NX...which we will tell you more about...later..."
Wow, I usually try to stay down to Earth, but obviously even this sentiment was pie in the sky lol. Whoever had just Zelda wins!!! Coincidentally, I've finished my Nintendo at E3 2016 bingo card. @VelvetElvis: The bottom box of the "I" column... not sure how much time Nintendo will take on that area... I don't think they will address that area at all... just saying. @DefHalan, I mean, they've got the whole conference. Might as well get into Link's crotch and the bottom of his boot soles. And if there's a female Link announced, I want to know about the bottom of her shoes, too. Put on your best sweater and let's do this, Aonuma. @VelvetElvis: lol, what about all those spaces with just lines of dark blue paint? @DefHalan, it's all Zelda. It's Zelda paint. Everything is Zelda. @VelvetElvis: Zelda Paint confirmed for E3 2016. The amazing successor to the 90's hit, Mario Paint and the best use of the GamePad to date. Also releasing on NX in 2018. Contestant: I'll take video games for 400 please. Host: Nintendo are bringing only Zelda to E3. Contestant: What the actual .... are Nintendo doing? VelvetElvis: lol, what about all those spaces with just lines of dark blue paint? Each one is 10 minutes of Nintendo talking about color theory. @TomJ, that's a guarantee — Reggie is walking damage control. I'd love it if someone asked him about his PR-riffic mantra last year, which was "we only believe in showing games that are coming out this year." And now they're showing nothing but a game that won't release till next year. @VelvetElvis: Is it wise to ask that question? Reggie is a big man, I fear he is Nintendo's secret weapon to annoying journalists who "ask the wrong questions". Is it wise to ask that question? Reggie is a big man, I fear he is Nintendo's secret weapon to annoying journalists who "ask the wrong questions". Is he like Tom Cruise where he forbids his girlfriend from wearing heels? okay guys , don't kill me , but i personally think that Nintendo's plan for E3 is actually pretty good ! MASSIVE SPLATOON PLAYER , LOVE POKEMON, FIRE EMBLEM AND BAYONETTA SERIES . 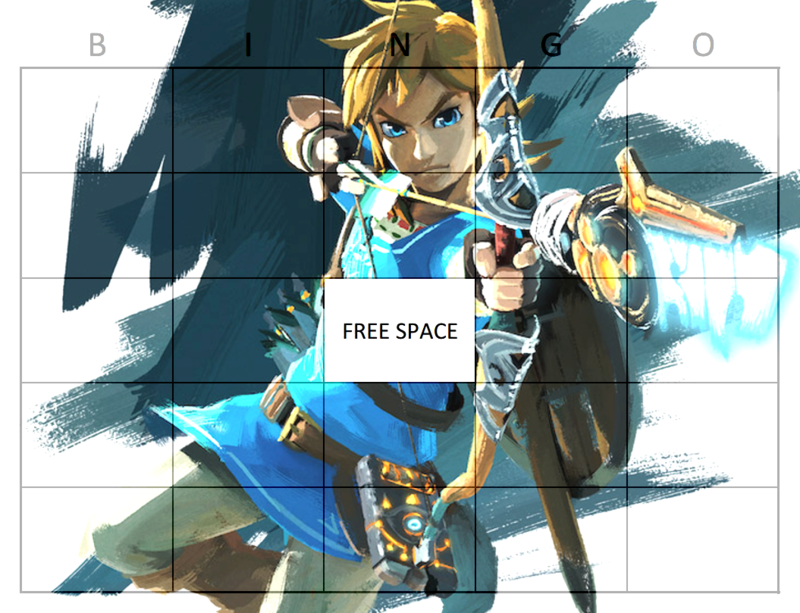 So based on what's confirmed, is this year's E3 bingo card just one square with 'Zelda U' written in the middle of it? And the list goes on. It'll most likely be like last year where there's a huge focus on already announced games but with a few surprises.